As a writer and editor, Kelly Link’s accomplishments stand out so obviously that it seems a shame to recount them. 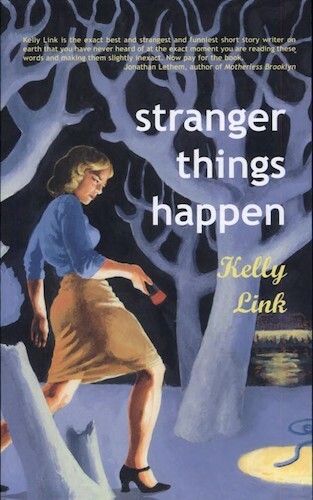 Having won three Nebula awards, a Hugo, and a World Fantasy Award, Ms. Link obviously impresses her fellow writers and fans of science fiction and fantasy. Her editorial work on the cult classic Lady Churchill’s Rosebud Wristlet magazine and Trampoline anthology commands equal respect and has led to her editing the even more renowned anthology, The Year’s Best Fantasy and Horror from St. Martin’s Press. Q: Why do you put some of your stories up online for free? KL: A couple of reasons. One: I have an inordinate and overpowering dread that someone will buy my collection and only then discovering they hate my fiction. That whole cow/milk/free thing? Cows–I mean books–they’re expensive! Even Ben and Jerry’s gives away some free ice cream once in a while. “Carnation, Lily, Lily, Rose” for instance is a zombie story. Or perhaps it is a romantic ghost story. Or perhaps it is a tribute to the 18th century epistolary novel. It is all and none. Similarly with “The Girl Detective.” It could be a Nancy Drew mystery. Or it could be an outtake from Big Trouble in Little China. Or it could be a retelling of the myth of Persephone. The author leaves it to you, gentle reader. “Travels with the Snow Queen” stands out in that it is clearly based on a single source–the 1845 Hans Christian Andersen tale–but the clarity of the source merely gives the author more room to mess with the reader’s head. This is a retelling where the author’s razor-sharp wit flays the skin of the folk tale and lays its skeleton bare, revealing it in all its absurd ugliness. Not convinced yet? Have a listen to the inspired horror story, “Most of My Friends are Two-Thirds Water” below. Or, play read-along with the audio and text together. Either way, we think you’ll enjoy the experience. Download PDF from Small Beer Press here.